Today was Day One of the Apple, Foxconn et al. v. Qualcomm trial in San Diego (Southern District of California). Formally, there are two cases, which the court combined under the official caption In re Qualcomm litigation. 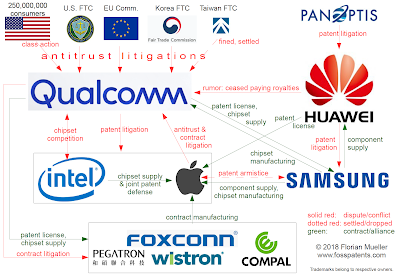 The reason for two cases existing technically is that a few months after Apple sued Qualcomm in January 2017, Qualcomm sued Apple’s four contract manufacturers (Foxconn, Wistron, Pegatron, and Compal), who counterclaimed. The contract manufacturers’ counterclaims became the economically biggest issue in the case, amounting to approximately $9 billion, which could be tripled (as a damages enhancement) to $27 billion. Qualcomm is seeking damages of up to $15 billion according to Reuters. The cases most closely related to the one being tried in San Diego as we speak are the U.S. Federal Trade Commission’s antitrust lawsuit against Qualcomm in the Northern District of California (where Judge Koh might rule anytime now, given that the trial took place in January) and a consumer lawsuit alleging that 250 million Americans who bought smartphone over the last roughly eight years overpaid to the tune of $5 billion (an average of $20 per consumer) because of Qualcomm’s accused business practices. Qualcomm appealed Judge Koh’s certification of the consumer class action, but let’s stay focused on the San Diego case (the real San Diego case, i.e. the antitrust case, as opposed to a patent infringement case that is a sideshow). In one of the strongest signs of there truly being one or more antitrust issues with Qualcomm’s business practices, the company has for some time insisted that those entering into certain agreements with Qualcomm were not allowed to complain to antitrust regulators (theoretically, they had that option, but at a high cost due to an immediate termination of rebates and even a clawback of past kickback payments). Judge Curiel found no contract violation of that kind by Apple, a decision that is worth a few billion dollars to Apple. Today a jury of nine was selected, which means that up to three jurors could drop out (the trial might take about a month, though there are only four trial days scheduled for this week and three for each of the following weeks until jury deliberations begin) and they could still reach a verdict under the district court’s Local Rules. There were some funny situations and remarks, but nothing specific happened today besides jury selection (and, which is unusual for a district court on the West Coast, a decision that no electronic devices with an active online connection could be used inside the courtroom, which is why live tweets didn’t continue after the lunch break). Opening arguments will be delivered tomorrow, and that’s when the trial really begins. On the eve of opening arguments, it makes sense to reflect on what this dispute is–and what it is not–about in high-level, philosophical, moral terms. The questions the jury will have to answer are unrelated to Qualcomm’s history of innovation in cellular communications. Not only would no one doubt that Qualcomm succeeded a few decades ago with a courageous and ambitious bet on a technique called code division multiple access (CDMA), but it’s also clear that Qualcomm has continued to invest heavily in research and development. No one claims they stopped innovating altogether. The dispute is all about whether they went, and are going, too far in their rent-seeking (and governmental agencies–antitrust enforcers–around the globe have so far found that it’s the case, imposing fines that in the aggregate amount to several billion dollars). If all that Qualcomm had done since its initial success had been to keep innovating, and if there hadn’t been any issues, then those competition watchdogs would have focused on other companies and this San Diego trial wouldn’t have started because Apple would never have brought the underlying complaint. Qualcomm’s patent royalty demands relate to entire mobile devices, including various components (such as more memory or larger screens) that are functionally unrelated to the layer of technology at which Qualcomm is innovative. As a consumer I can always use an Android device instead of an iOS gadget. But either way I’ll pay the Qualcomm patent tax (ironically, the IRS described itself as Qualcomm’s “silent partner,” literally). That patent tax is artifically inflated by means of such practices as royalties on repairs, royalties on royalties (meaning that the royalty base for a royalty includes among other components the royalty), and interest on interest). They charge royalties separately from the prices of the chipsets they sell, though the longstanding judicial doctrine of patent exhaustion says that after you’ve sold a product you can’t assert your own patents against it later. 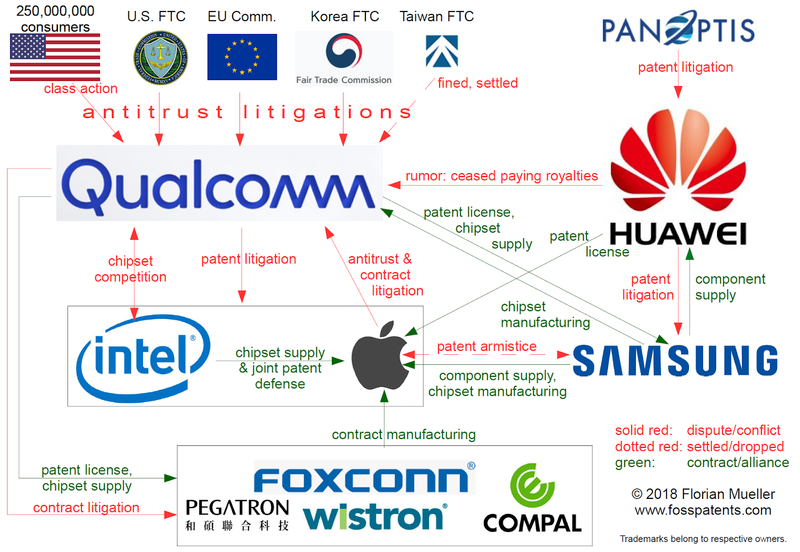 What’s under attack (not only in this particular trial but in a host of cases as shown in the battlemap further above) is not Qualcomm’s business model in its entirety, but certain problematic practices. Qualcomm will have a bright future either way. It will continue to create jobs. It will continue to rake in huge profits. It may, however, have to make some adjustments so as to ensure an allocation of resources that will work best for the economy and for society. This is a story à suivre.